Fantastic news… I bought my [replacement] dress this morning! Steve has to spend 6-7 hours at a work orientation in Miami, so I was a nice fiancé and drove him up there. Good thing too since the most direct route was all torn up and I needed to use my old shortcuts around the city. Rather than drive the 45min back down to Homestead, I hung out in my old stompin’ grounds. I went to Dadeland mall, with the intention of hitting all the anchor stores and seeing what they had. Nordstrom, not anything of my taste in the dress section. Moved on to Macy’s, wandered around checking all the rack, honing in on white and blue and finally saw it. White, short, lace, full skirt, ribbon belt. I grabbed 2 sizes, wandered some more, then hit up the dressing room. A-dor-able! I could envision it with a different color belt. The skirt is full enough to allow for numerous petticoats, depending on how full I want it. The straps are wide enough that I don’t need to worry about special undergarments… hello, Spanx! And the lace is simply gorgeous! I texted a handful of friends with a picture and posted it to twitter. The reaction was all positive and for a whopping $75 plus tax, the beauty was mine! Yes, she was on sale, but even the regular price of $99 was damn reasonable. 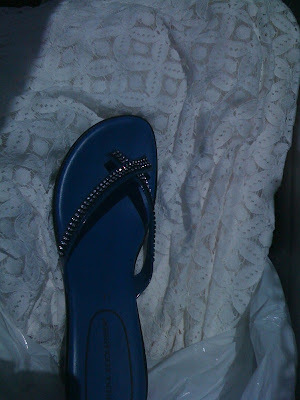 At the “suggestion” of a friend, I ended up hitting up all the shoe stores in the mall and found some super cute cobalt blue wedge sandals. Granted, by the time I bought them, I felt like my feet were going to fall off between the blisters – Chucks with no socks is evil! – and walking on the sprained ankle. The sales girl was wearing them in black, which is always a good sign of extreme shoe comfort, and told me she is pregnant, another good sign. They were mine. Another $45. Bear in mind that the other dress sold for $279 plus shipping, so I am definitely under the budget I set for myself. I purchased 1.5″ wide orange ribbon and 5/8″ blue ribbon. My plan is to sew the blue to the orange and replace the black ribbon currently on the dress. The ribbon currently falls higher up that I like, so I’ll be cutting off the loops as well.